Get summer started in the spring time! In combination with Fashion Week, the Food + Wine Festival Palm Desert heats up the famed El Paseo Shopping and Dining District every spring. The third annual event has some help in the fire department with a wood burning brick pizza oven courtesy of Piero’s PizzaVino. 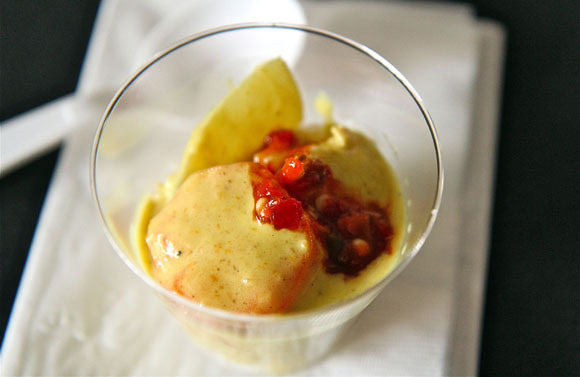 Flowing wine, champagne and spirits, and niblets from 50 restaurants showcase scrumptious from the Coachella Valley and beyond. 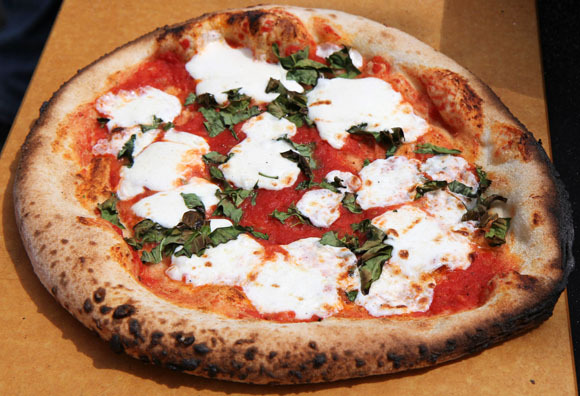 Pizza Margherita from Pieros’s PizzaVino. 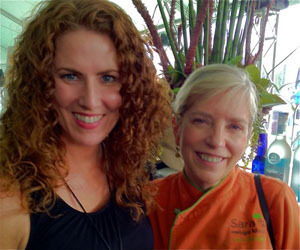 The thermometer rises when I interview legendary television chef, Sara Moulton. Watch the Food & Wine Festival Palm Desert 2012 Video to find out the one secret Moulton says she didn’t reveal on her long running Food Network show, Sara’s Secrets. And FYI, when you’re a legendary chef like Sara Moulton, the secret involves Julia Child. And you may need to be bleeped. Seriously. Chef Sara Moulton’s eyes smile. I can tell she’s a little tired after a full afternoon catering to adoring fans in the perfectly warm Palm Desert weather. I get the chance to catch up with the 2012 James Beard Nominee, ironically, after her mobbed book signing. She only has a few minutes but turns her charisma back on… and let’s her hair down. Seriously, you need to watch the video. After revealing her final secret, we go on to talk about Sara’s mentor and friend, Julia Child. I ask Moulton what she thinks Julia would think of the sport that has become of Food Television. You can count on it! Cheers! Yellow Curry with Chicken and Vegetables from Legacy Thai. 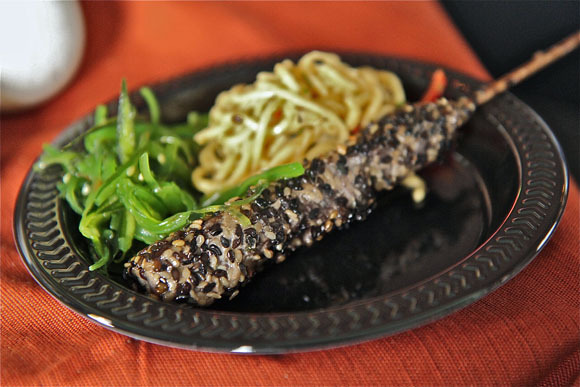 Sesame Crusted Ahi Skewer with Soba Noodles and Seaweed from C Level – Island Prime. 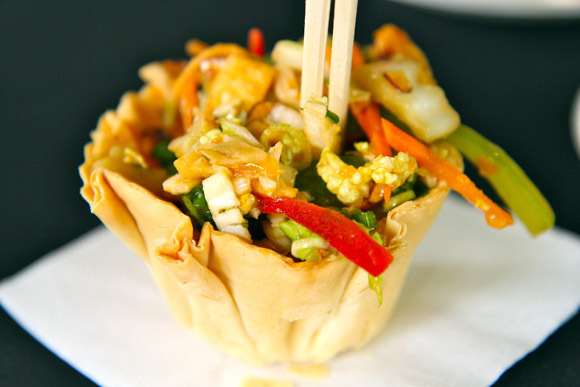 Chinese Chicken Salad from Escena Lounge and Grill. Special thanks to Chef Sara Moulton and Lydia Kremer, Vortex News PR; and everyone that worked so hard to produce another successful year of Food + Wine Festival Palm Desert. Food + Wine Festival Palm Desert is a Palm Springs Life event produced by J. Hocker & Associates with numerous sponsors, including the City of Palm Desert, Time Warner Cable, The Culinary Institute of America and Friends of James Beard Foundation. Tasty looking food and a great interview. You really caught the impressive genuineness of Chef Sara Moulton, a real talent in the culinary universe. What’s great about her is the youthful outlook & sensibility. She was one of the early pioneers of Food Network which she deserves more credit for. Sara did two live shows a night on weekdays (taking real phone calls)and made it all look effortless.